Strange, bittersweet, fun little movie set in the mid-80's about two young English boys bonding as they make a homemade film inspired by First Blood. Both children come from troubled homes: Will, escaping to fantasy from a strict religious upbringing, and Lee, lashing out from absentee parents and an indifferent older brother. Both boys find freedom and exhilaration in their dreams (and dangerously reckless stunts) of making a movie. Really good 80's New Wave soundtrack used effectively. Not at the level of Danny Boyle's Millions, but curiously enjoyable and well-made, with touching performances by the two lead boys. 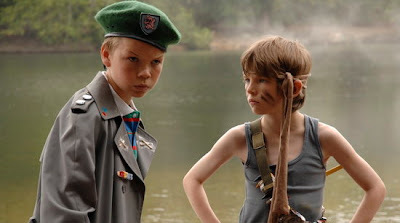 The Son of Rambow movie they made wasn't too bad either for a couple of pre-teens. I'd say it was better than the last three M. Night Shyamalan movies.